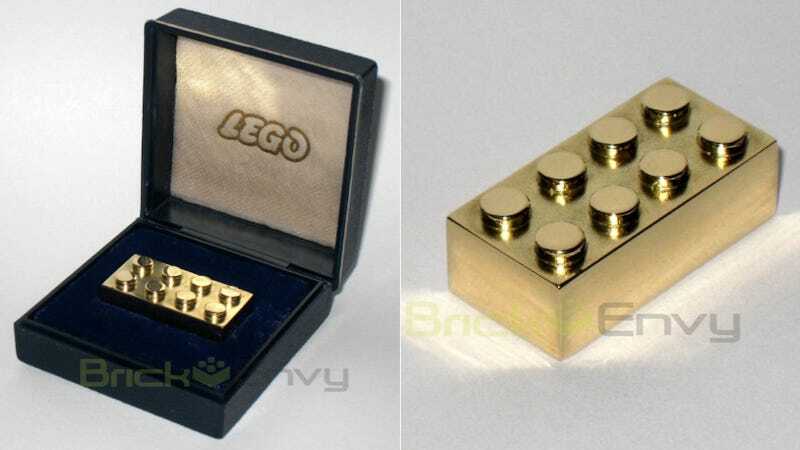 With all the insane, high tech Lego contraptions running around these days, it's easy to overlook the beauty in a single, elemental brick — unless that element is solid, 14-carat gold. These standard-sized, 2x4 Lego bricks were only given out once or twice a year from 1979-1981. Even then, only select business partners and Lego employees clocking in 25 years of employment had a chance of getting their hands on these rarest of accolades. But thanks to the internet, these bricks aren't just restricted to Lego legends anymore. Anyone (with $14,500 to burn) can buy their very own, shimmering block from Brick Envy, an online store that has somehow found one in their possession.